I love chili, but for my whole life I’d only ever been exposed to chili that’s packed full of beans. 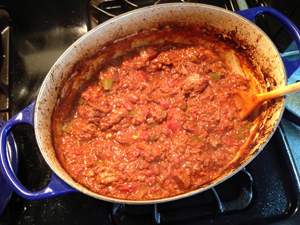 When I went paleo, I thought that good chili would have to be relegated to a sometimes food. 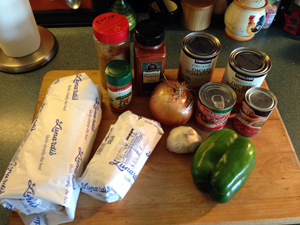 But then, on a whim, I did a search for recipes for bean-less chili…. …And I discovered that I’ve been doing it wrong my whole damn life. According to the prestigious historical source of Wikipedia, chili’s ancient origins in the American Southwest began as just spicy meat in a thick sauce. No beans in sight. Beans were probably added later as a cheap way to make the stew stretch further. Somehow, that method became the norm, and chili without beans became reclassified as “Texas-style Chili,” an obscure suborder to the family tree. Once I knew what to look for, recipes started flooding in from across the interwebs. The ones that jumped out at me were the ones that used real stew meat as well as ground meat. I felt like some sort of culinary archaeologist, reverse-engineering the glorious past this food had strayed too far away from. Anyway, starting with those Texas-style recipes, I soon started fiddling around putting my own spin on things. This recipe uses one of my favorite “secret ingredients:” chipotle chilis in adobo sauce. For those whose experience with chipotles starts and ends with the fast-food logo, basically chipotle chilis are smoked red jalapeno chilis and adobo sauce is a richly flavored sauce that they are often packed with in cans. I’ve been playing around with tossing these things into burgers and other things for a while now, but I really made an evolutionary leap ahead when I came up with the idea of tossing the whole shebang into a food processor and using that as a spicy base for things. This recipe takes all the wonders of an all-meat, paleo friendly chili, and elevates it with some extra smokiness for a unique kick. Take the entire can of chilis in adobo and dump it in a food processor along with the paprika, cumin, cayenne pepper, anchovy paste, and some salt and cracked pepper. Blend until smooth. Season the meats liberally with salt and pepper and let them come up a little closer to room temperature before cooking. 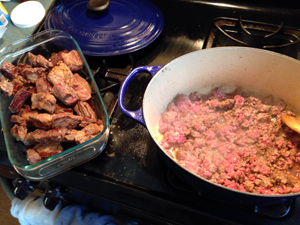 What I like to do is brown the stew meat first, in batches, then brown the ground meat so that it soaks up all the bits from the stew meat. Essentially I’m de-glazing my meat juice with more meat. Aw yeah. Even if you are using a slow-cooker, I absolutely recommend taking the time to do this step. Cook down the onions and peppers for about 5 minutes, until the onions are translucent. THEN add the garlic and cook until fragrant, which should only be a minute or so. Garlic burns really easily so you should only add it at the very end of the sauteing process, right before you start dumping in the liquids and stuff. If you are using a slow-cooker, you can probably get away with skipping this step. 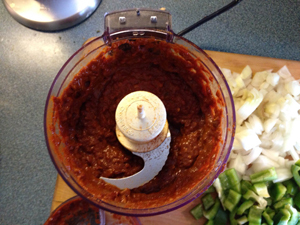 Add the two cans of diced tomatoes (with juices), the can of tomato paste, and the chili paste. Stir and simmer for a little bit to bring its temperature up. Then add the meat and stir again, making sure everything is well distributed and covered. If you feel like you need more liquid, add some broth/stock/water. I like my chili thicker, but I find that it’s better to add liquid earlier and just cook it off later if necessary. I recommend cooking at least 2.5 hours. I try to time it so it cooks closer to 3 or 4 hours. If you are cooking in the oven, make sure the pot is well-covered and cook at 350°. Pull it out occasionally to stir and check on its progress. If you are cooking in a slow cooker, I recommend starting it off on high for 2 hours or so to get the temperature up, and then low for 3-4 more hours. If you’re going to be out of the house all day, then just leaving it on low for the entire time should be fine too. If the meat looks ready but the consistency of the chili is either too thick or too thin, simply add more liquid or cook down by removing the lid and letting it simmer longer. Spicy and thick is how I like mine. Heh heh heh…. This is also a great starting place for you to branch off and develop your own recipe. You could easily sub out any type of meat you want (including, URG, ground turkey. Blargh.) The last time I made this was for game night, and when we realized we were really hungry, we added in some spicy andouille sausage as well to bulk things up. If the smokiness from the chipotles and the smoked paprika isn’t enough for you, try adding some dashes of liquid smoke. I rarely do, though, since I find that this recipe comes out with just enough smokiness for both me (who would probably lick a campfire if she could) and my friends (who would not). Im so excited to try this variation. I too LOVE chile and am always looking for little tweaks. I have used chipotle chilis in adobo sauce before for sauces and stuff. soooo goooood !!! I did do a mini-Thanksgiving feast for our game night last Thursday. I got a small pre-brined turkey from Trader Joes which was surprisingly easy and turned out well, even though it was my first time doing a turkey. I read one website that recommended cooking the turkey breast-side down so the juices collect in it more, and that did work well. We made a gravy using the giblets and tapioca flour/almond meal as the thickener. Tasted kinda livery, but it was certainly healthy! I also did big batches of brussel sprouts, cheese biscuits, and yukon gold mashed potatoes at the request of our GM (gotta keep the GM happy 😉 ). We were all sooooo full by the end that we barely had room for the gluten-free pumpkin pie that Kara made. I remember standing at the counter, staring at aaaall the pieces of pie left in the pan, trying to will myself to have another piece because it was so flavorful and amazing, but I physically could not bring myself to put another bite of food in my mouth. Thank you for this recipe. It’s the star of my all-day cooking marathon.